In the year 1964 all hell broke loose in the Uptown neighborhood on Chicago’s far north side. Puerto Rican migration began that year and new Puerto Rican gangs formed nearby like the Latin eagles for example. Many white greaser gangs were also popping up in the Lakeview and Uptown areas. 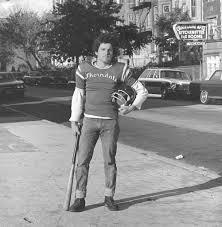 At the intersection of Thorndale and Kenmore in 1962 a 14 year old youth by the name of Joe Ganci organized a greaser gang that became known as the “Thorndale Jarvis Organization.” Ganci led his gang to be some of the toughest greasers in the Uptown streets. In 1963 the TJOs began a conquest to overpower all the neighborhood greasers around them and the fights became so brutal that stores installed bars on their windows and by 1964 everyone in Uptown knew who the TJOs were and began to fear this wild group of teenage greasers, and by then the TJOs had taken over Senn High School. 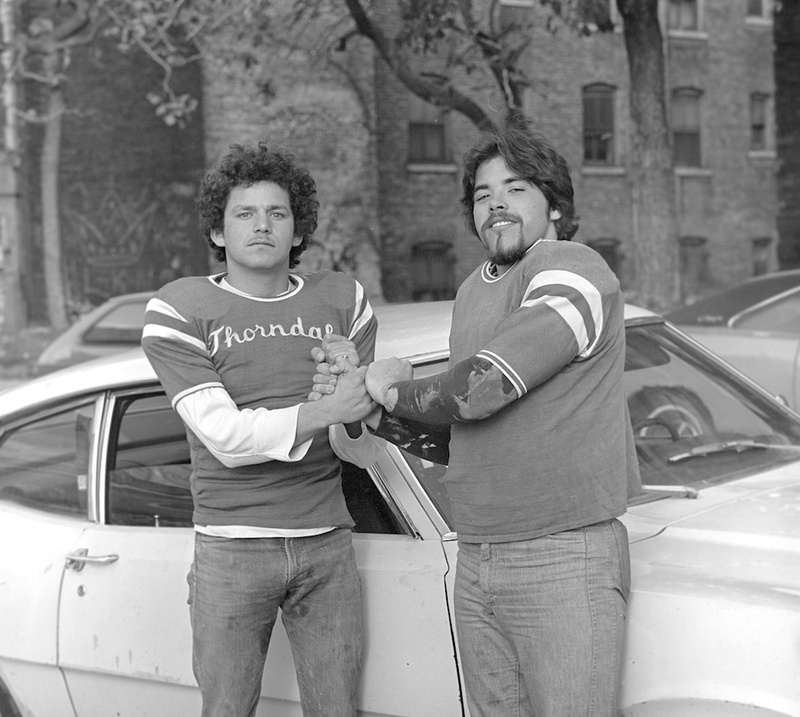 At some point in the 1960s the TJOs made the newspaper for the first time and the Chicago police were interviewed about the TJOs, one police officer said they were a bunch of “Jag Offs” and the gang thought it was hilarious, so hilarious they renamed their organization the “Thorndale Jag Offs;” however, outsiders were not allowed to call them that or there would be consequences. In the year 1969 the TJOs made the newspaper again on November 8, 1969 when TJO gang members Peter Cusack and Donald Ritt beat Robert Boyce with a bottle and a car radio antenna at a drive in at 5627 Olive Street (Clark and Olive). The two TJOs beat the man because they became angry after Boyce defended his wife’s honor after the two TJOs insulted her. The drive in owner did nothing to stop the fight nor did he call the police, in fact, nobody watching the fight did anything, when Susan Boyce tried to go into a tavern nearby to call police the owner told her to go elsewhere to call. The police arrested the drive in owner for not calling the police or trying to stop the fight. The drive in owner claimed he called the police but his phone records showed he did not (Chicago Tribune Page 20, Nov 9, 1969). The fact that nobody wanted to help or call the police showed how the neighborhood feared the TJOs and how they already ran the neighborhood at that point. In that same year four TJOs were arrested for breaking into Swift Elementary and vandalizing the school property, they also set 4 rooms on fire. The 1970s would bring about an even more violent side of this white greaser gang especially once African American students began attending Senn High School in 1971. For the 1971-1972 school year the city decided to bus in black students from the south side of Chicago to get better education opportunities, the TJOs immediately objected and began attacking black students that they identified as Black P Stone gang members. The fights were massive in and around the school and TJOs were blamed for being the aggressors of the fights. The TJOs would gather after school at Bob’s Restaurant at 5863 N. Glenwood Avenue (Glenwood and Ardmore), while the Black P Stones would gather at Chubby’s Carryout at the same intersection. On April 15, 1972 the Black P Stones attacked Bob’s Restaurant and smashed all the windows, the TJOs went on the defense and attacked the Stones which resulted in a massive gang brawl as bottles and chains were being used. The fighting between the two gangs flared up again in April when someone pulled the fire alarm at Senn High School so a fight could break out between the gangs, in this fight Puerto Rican gangs joined in especially the Puerto Rican Stones gang who were allies of the Black P Stones, this brawl caused the school to close for a while that school year. 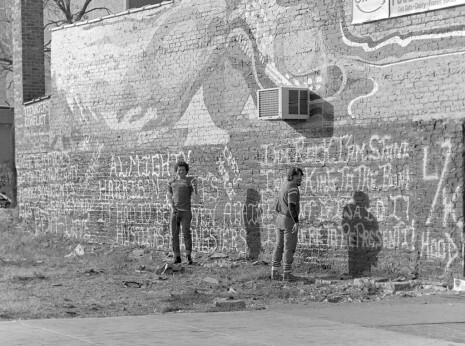 In the year 1973 residents of the Edgewater section of Uptown were fed up with the gang violence and extreme poverty of Uptown; therefore they petitioned with the city to achieve succession from Uptown and the petition was granted, this was the birth of the Edgewater neighborhood; however, residents could not escape the grip of the TJO gang that had all their territory within the Edgewater community. The TJOs were under the leadership of 22 year old Gary Kellas who was well known and feared in the community. The TJOs wanted to be the only gang to dominate Edgewater and they basically achieved that; however, residents wanted the gang of 300+ members gone and the residents were planning to fight back. In July of 1973 the leader of TJO Gary Kellas brutally beat Bill Cooper with his steel toe boot by kicking him in the face after Cooper yelled at him, residents then got together and gave the Bill Cooper the courage to press charges against Kellas especially since the attack nearly took Cooper’s eyelid off. The courage to press charges and the backing up of residents came after an attempted motorcycle theft by gang members in which residents tried to stop the theft but it resulted in over 40 members of TJO terrorizing the buildings especially when they taunted a mentally disabled boy simply because residents got involved. This was the point where residents were pushed over the edge and Cooper filed charges against Kellas that got him 6 months in jail. After this incident residents continued to report every single crime they saw the TJOs do and they even appeared in court to make sure charges were filed, this carried out the remainder of 1973 until TJO backed off residents and even filed a lawsuit against the citizens group known as Ardmore-Victoria neighborhood group for infringing on their civil rights but the suit was dropped three years later; however, the legal fees cost the group over $2,000. The Thordale Jag Offs was a dangerous gang of stone greasers and was well known in the Uptown, Lakeview and Edgewater communities. Every member of TJO wore steel toed boots on a daily basis since they first formed that was used to brutally kick enemies they knocked down. 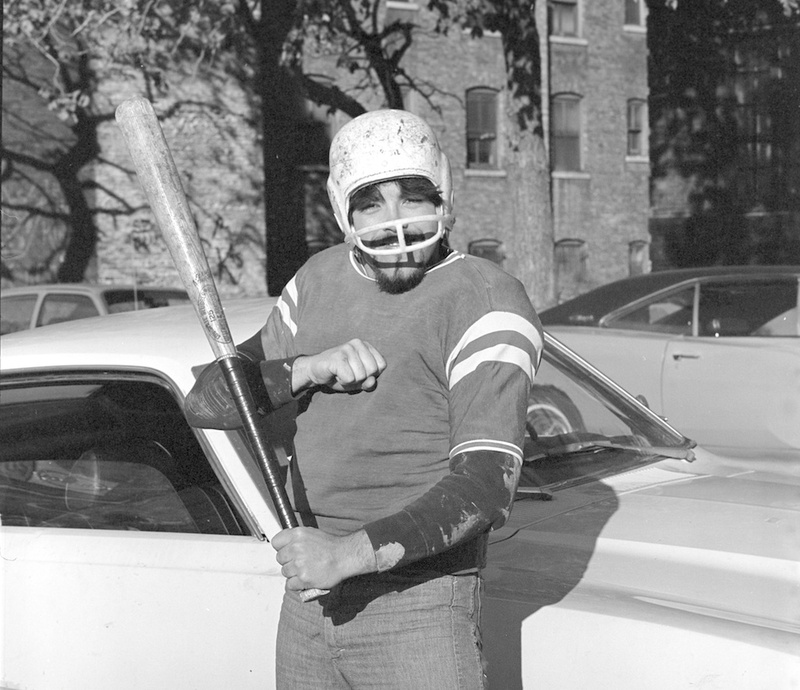 Gang members were even known to go as far as wearing football padding and football helmets when they went into a gang fight which made them look like whackos and could intimidate an enemy. The most feared names of TJO were Gary Kellas, the leader of the gang and Joe Ganci who was the founder and also the unofficial behind the scenes leader of the gang. These two men along with James Oldham were convicted of murder and attempted murder of two men at the intersection of Devon and Lakewood in 1974. The three TJOs saw the two men and ordered them to put their hands up as Ganci pulled a shotgun on them and after the men raised their hands Ganci shot both of them killing one man and wounding the other. Both victims were gang members but it was never disclosed in court documents their gang affiliation. The men were charged with murder and Joe Ganci got the harshest sentence and ended up spending the rest of his life in prison until he died after being sick in solitary confinement at Menard Correction Center (People vs. Ganci, 1978). After incarceration Ganci plotted an escape in 1975 alongside 5 other men who were members of TJO and the Playboys gang. One of the escapees Joseph Greer smuggled in hacksaw blades into his cell that was enclosed within a packet of 8 books delivered to his cell. The men then took magnets from radios and placed them in the door jams so that the cell doors would close but not lock, the prisoners would then roam into the cell of 2 of the escapees Peter Mukite and Richard Covelli and for many days the men sawed a hole in the wall with the hacksaw blades into the ventilation area. On the day of the breakout they tied several bed sheets together to form a rope and climbed into the ventilation shaft and sawed open the latch, they then lowered themselves down using the rope to a newer patch of fence outside that had no barbed wire yet, the men then climbed over the fence then snuck past the guard towers and onto Sacramento Avenue. 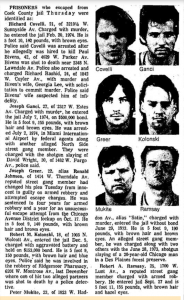 The men were eventually apprehended (Chicago Tribune Page 8, July 11, 1975). After the leadership of TJO was put in prison in 1974, TJO would not operate at as much strength especially since the police and the citizens were all over them; however, they continued to be a strong enough presence throughout the rest of the 1970s decade and were still a feared force on the streets. In 1979 the TJOs made the news again when they kicked a man’s eyeball out of the eye socket in his head. 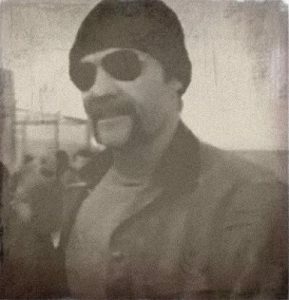 In the year 1984 the TJOs were given new life once Gary Kellas got out of prison after being released early for his part in the 1974 murders. As soon as Kellas got out he became heavily involved in selling large quantities of cocaine and the police soon found out through informants that Kellas was up to no good again. 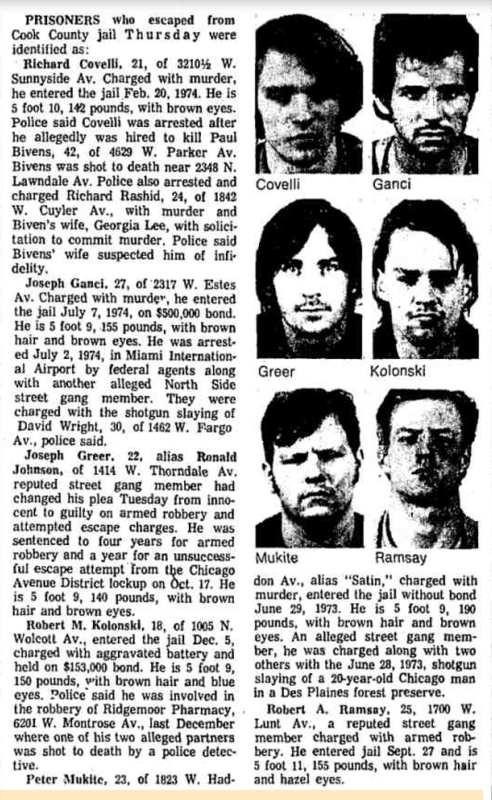 The police then set out to take down Kellas by sending in an undercover agent to buy $22,600 worth of cocaine from Kellas on October 16, 1984 out in front of Carson’s Ribs at 5970 N. Ridge Ave (Paulina and Ridge). The officer went to hand the money to Kellas, Brian Deering and Eric Huber when Kellas pulled an Israeli Uzi submachine gun out and demanded the money in exchange for no cocaine by saying “give me the money or I will kill you!” Basically the cop was getting jacked. The officer then knew he was in trouble and yelled “it’s a rip, it’s a rip!” The undercover police van nearby then opened up as officer Claude Posilovich emerged and screamed “Police” and that is when Kellas and the others opened fire on the van then sped off as officers shot out the back window of Kellas’ Trans AM (Chicago Tribune Linnet Myers February 1, 1986). Nobody was killed in the shooting even though 32 bullets were fired, only Deering and Huber were wounded but all three were convicted or armed robbery of a police officer and by 1986 Kellas was given a 30 year sentence. After this happened and Kellas was convicted the Thorndale Jag Offs went extinct. Joe Ganci went on to lead the “North Side Gang” in prison which is a white supremacist gang that consisted of many former white street gang members of organizations such as Gaylords, Stoned Freaks, Taylor Jousters, P.V.R, C-Notes, Uptown Rebels, Insane Popes, Simon City Royals etc….The TJO organization left behind a major legacy of being feared and tough greasers and some people in the community actually wanted them back after they were gone in order to protect their businesses that had been done when TJO reigned supreme. Please send in 1960s, 1970s and 1980s pics!